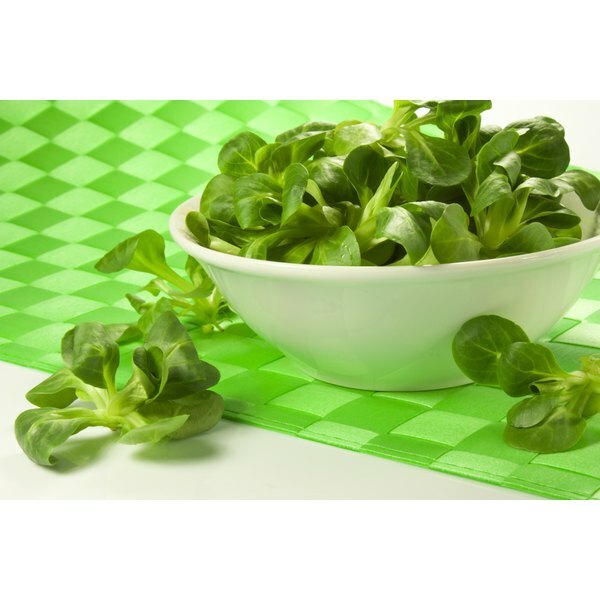 Mache is a type of lettuce that is available in many specialty grocery stores. Also known as lamb’s lettuce, corn salad, field salad, or field lettuce, mache grows in rosettes or loose bunches. Mache has 475 Calories and 5.00 g of Protein per 100 gram serving according to the nutrition facts provided by the USDA Food Composition Database. Each 4 oz. serving contains 25 calories. It also has 3 g of carbohydrates, 0 g of fat, 2 g of fiber and 2 g of protein. A 4 oz. serving contains 2.2 mg of iron, 459 mg of potassium, 38 mg of calcium and 38 mg of vitamin C.
Mache contains almost half the daily requirement of vitamin B9 (folic acid) at 160 mg per 4 oz. serving. Mache is a natural plant source of omega-3 fatty acids. A 4 oz. serving has more than 250 mg of omega-3s. The omega-3s in mache help lower triglycerides and improve HDL (good) cholesterol levels, which reduce inflammation, and help reduce the risk of cancer and heart disease. Folic acid is highly recommended for women of childbearing age. Folic acid is also believed to improve stress and reduce depression. Based in California and Maine, K.M. Chapman is a freelance writer, photographer and educator. She is a former weekly columnist, and has been published in newspapers, in-house publications and online. She is an intensely curious former science teacher and a cohort of the Maine Governor's Academy for Science and Mathematics Educational Leadership. She has a Bachelor of Arts in communication studies.